GCA Altium acted as exclusive financial adviser to RIMED AG, the leading medical imaging group in Switzerland, on a minority investment through a capital increase to Luxempart German Investments S.A.
RIMED AG has, since its inception in 1994, developed into one of Switzerland's leading medical imaging providers. The company operates seven multi-modality diagnostic imaging locations and maintains nine additional partnerships in Switzerland, which allows the group to cover the full range of modalities within the Swiss radiology market. As part of RIMED’s further expansion strategy, Luxempart German Investment S.A. acquired a minority stake in RIMED through a capital increase for an undisclosed consideration. CEO and Founder Dr. Kim B. Laver, who retains a majority stake in the company, will continue to manage and grow the business independently on a long-term and sustainable basis. 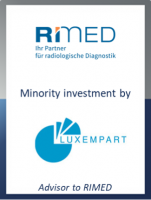 The new funds provided by Luxempart are earmarked for continued organic growth, expansion of existing locations and buy-and-build growth to consolidate RIMED’s leading position in the Swiss radiology market. “We were closely advised by GCA Altium. The team assisted us greatly throughout the process with their wealth of experience and professionalism. They were great to work with and helped us to secure the right investor for the business,” commented Dr. Kim Laver. This latest transaction sees GCA Altium build on its leading position as an international healthcare services adviser, having completed 10 transactions in this sector since the start of 2016.